Let me tell you about the dinner I just had. Yesterday I bought one of my favorite books (that I’ve written about about on the blog…) Lunch In Paris by Elizabeth Bard. I read the book this past summer, but I knew it would be a book that I had to have in my own personal library. I was doing my errands yesterday after my walk, and popped into Books on the Square and noticed that Lunch in Paris was in their top 15, which means an automatic 10% off the price. So, I bought it. Once I bought it I flipped immediately to the recipe I remembered (and dreamed of) the most… it’s on pages 15 – 16: Pasta à la Gwendal. You can see the original recipe in the book, I’ll let you know what I did. I woke up. Made a latte with my 1% milk and some strong coffee. I had a bite of the last ginger and lemon scone as I ran out the door. I spent the morning visiting one of my good friends from college and his two kids. It was a really fun morning, and I was very surprised by how I was not hungry – I’m pretty sure it was the latte. That will definitely be on the menu again tomorrow morning! After I got back from my visit, I made a quick peanut butter and jam sandwich on a piece of whole wheat bread and had a half a cup of yogurt to go with it. Then I changed into my winter exercise gear and headed out for another walk. It was about two degrees warmer than yesterday. I added four minutes to my walking time – 34 minutes today! To start things out, I diced about 1/3 of the large onion I purchased at WF. Then I diced up two cloves of garlic. I cut up the small zucchini and summer squash into thin slices which I then cut in half. I cleaned and cut up a bit of the fennel (I was cooking with fennel for the first time in my life tonight, so I did not add a whole lot, since I was not sure what the flavor would be and how it would affect the meal). Then I ended up cutting one large carrot, julienne style. I had two button mushrooms in the fridge, and cut them up as well as five cherry tomatoes. Finally, I cut up the two slices of bacon into small pieces. I heated up a pan with about two tablespoons of olive oil. Once the oil was hot I added the garlic, onion and bacon. I cooked these three ingredients for a couple of minutes, the onions were translucent when I added the rest of the veggies. I also had a pot of water boiling for my pasta. Eventually the veggies cooked (carrots took the longest, I think – they still had a little crunch to them when I was eating. I reserved about a 1/2 of the pasta water and added a bit of it to the vegetable mix. Once I drained the pasta I added it to the pan with the vegetables and bacon. 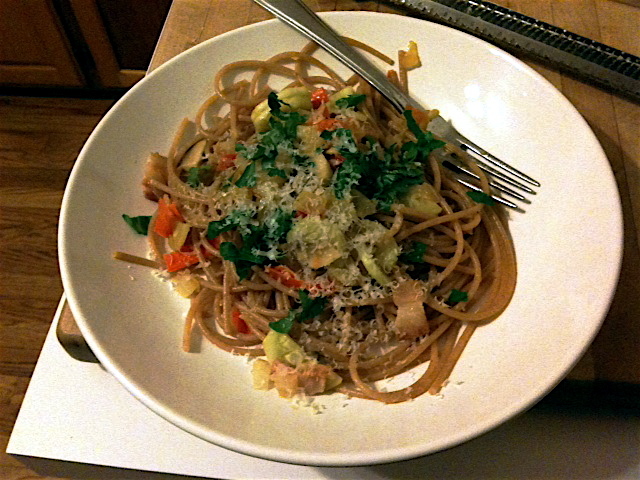 I garnished the pasta with parsley and freshly grated parmigiano reggiano. This meal is definitely a keeper. I loved it. You really need to get the recipe out of Lunch in Paris and make it for yourself. For the record, I loved the fennel. I loved how all of the flavors worked together to form the most amazing taste. I had a pretty big plate of food for dinner tonight (well, it was a lot of vegetables – I told myself) and I went back for the smallest second helping. I wanted to eat more but I couldn’t. I am curious to see how the leftovers are for tomorrow night’s dinner! Ok, I’m off. Planning another walk tomorrow. See you then! That dish does sound and look delicious. I’ve heard of fennel and I’m trying to think how it looks before it’s cooked. Obviously I’ve never used it. Last night’s photo was not great because my camera was not working, so this is an iPhone photo. Tonight I will take a better one, because the Cannon is working again. Phew!